From Nepal – worth 1000 Words! This entry was posted in Award-Winning, Children's Picturebook, Christmas, Kid Fans, Uncategorized on October 29, 2014 by Sherrill S. Cannon. How nice when a fellow author shares a screen-shot! Thank you Michal!! Thanks so much to Michal Yahalomi Noah for sending me this cute “Congratulations” note! Made my Day!! 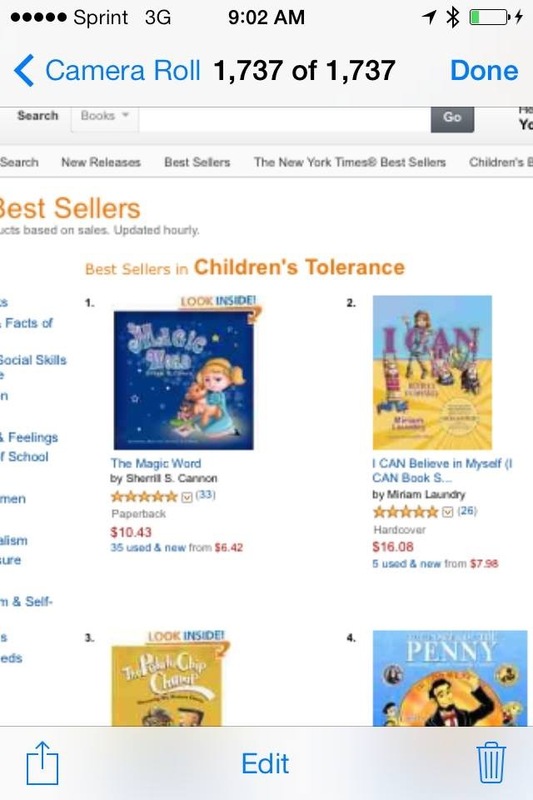 This entry was posted in Uncategorized and tagged Award winning, Children's Picture Books, The Magic Word on October 28, 2014 by Sherrill S. Cannon. 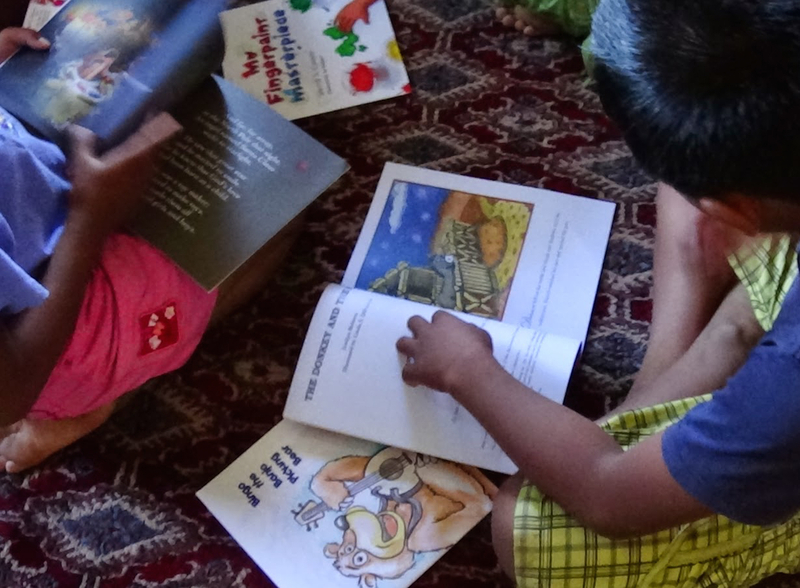 My books have arrived in Nepal, to be shared with the orphans there… Lorilyn Roberts, founder of the John 3:16 Network, has traveled there to donate books and to read to the children. Many wonderful authors donated books for the trip. I’m glad I included my cards! 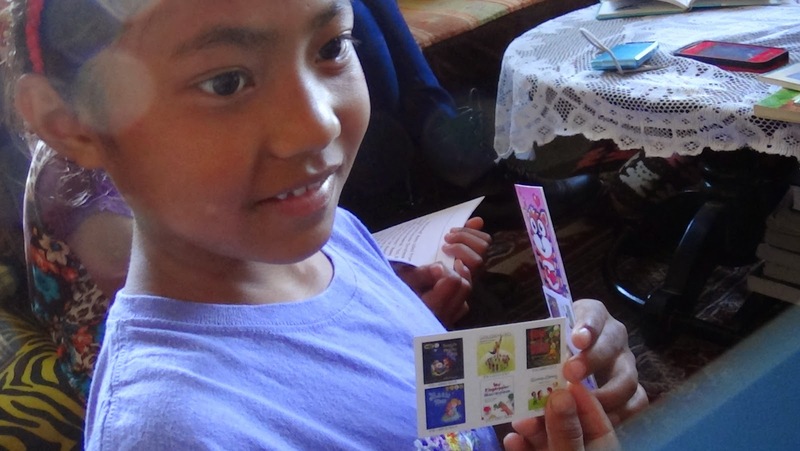 This entry was posted in Uncategorized and tagged Children's Picture Books, John 3:16, Trip to Nepal on October 26, 2014 by Sherrill S. Cannon. This entry was posted in Uncategorized and tagged Award winning, Childrens Books, manners, Sherrill S. Cannon on October 25, 2014 by Sherrill S. Cannon. Thank you Nicole Weaver for my Interview! 3 Awards for My Fingerpaint Masterpiece! Nicole Weaver, a fellow Readers’ Favorite winner, was kind enough to ask me for an interview. Thank you, Nicole, for this opportunity! 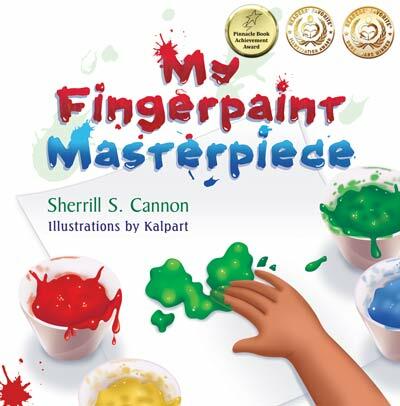 “Award winning children’s author, Sherrill S. Cannon is a true inspiration to me. She has made major contributions to the children’s book market. I am so happy I got a chance to learn more about her books through this interview. Thank you, Sherrill, for doing this this interview. I hope you continue to inspire young minds through your wonderful books. I am a former teacher, mother of four and a grandmother of ten, and am also an Award-Winning Best-Selling Author! In less than five years, my books My Fingerpaint Masterpiece, Manner-Man, Gimme-Jimmy, The Magic Word, Peter and the Whimper-Whineys, and Santa’s Birthday Gift have received twenty-eight 2011-14 National and International awards. 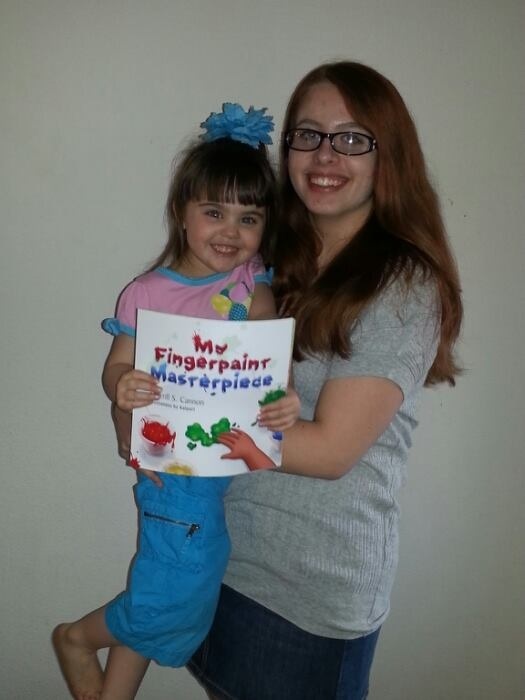 My newest, My Fingerpaint Masterpiece, has just won the Gold Medal for Children K-3 in the 2014 Readers Favorite International Awards, as well as an Illustration Award. It has also won a Pinnacle Achievement Award. My book Manner-Man has won 10 awards, most recently the prestigious CLIPPA (Principals’ Award) for K-2. All of them have been Readers’ Favorite medal winners. Most of my books try to teach something, like good manners and consideration for others. Once a teacher, always a teacher…All of my books are now part of a fundraiser for the anti-bullying campaign at imbullyfree.org. This site is imbullyfree and 50% of the cost of her books will go directly to the imbullyfree organization! Manner-Man is now the Superhero for the Bully Bear kids!! All of my books are also part of another fund-raising effort: for the Cure JM Foundation, to help find a cure for Juvenile Myositis, an incurable children’s disease. Since many children with CureJM are also bullied, it is a win-win for both causes! I am also the author of seven published and internationally performed plays for elementary school children, which have been produced in the United States, Canada, and the United Kingdom as well as Australia, Austria, Botswana, Cambodia, France, Germany, Ireland, Japan, Poland, Singapore, Spain, and the United Arab Emirates (so far). I am a resident of New Hope, PA and travel with my husband of 54 years throughout North America in our RV, sharing my books along the way! I have always loved poetry, especially structured poetry with rhyme and meter, and wanted to share that love with children. I also wanted to be able to teach, as well as tell a story, so my books are really life-lessons disguised as fun stories! I have been a “writer” since I was 4-years old, when my mother would write down my poems for me. I had quite a large collection, but unfortunately they have been lost. I spend most of my time marketing the books I already have… That takes creativity, too! Nicole Weaver is the author of My Brother is My Best Friend, a cute story about twin boys, written in three languages! I’m sure this book will be enjoyed especially by children who are in multi-cultural families and who speak dual languages, but it is also wonderful for those who only speak one of these languages to learn about ways to tell the story in another language! What a talented author and a great idea! The twin boys are adorable, and the story illustrates the way that brothers bond as they enjoy the world around them. This entry was posted in Uncategorized and tagged Award winning, Childrens Books, interview, readers favorites, Sherrill S. Cannon on October 24, 2014 by Sherrill S. Cannon. 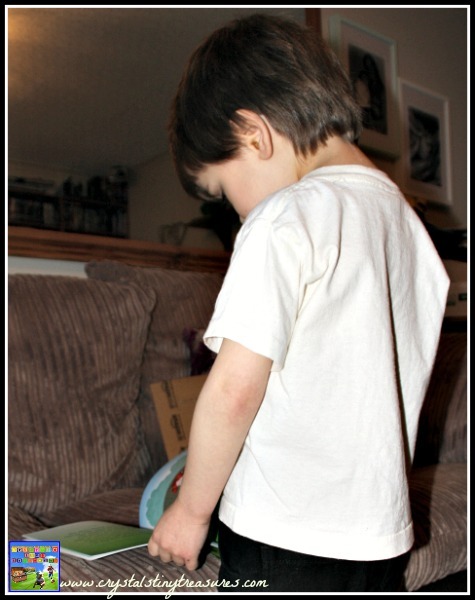 Peter and the Whimper-Whineys Review…Tristan’s new favorite! I received an awesome review for Peter and the Whimper-Whineys from Crystal McClean this morning…just in time for Halloween!! Have you ever experienced periods where your children drive you crazy with whining? Come on, be honest, we’ve all suffered through this stage a time or two…or three.., well, you get the picture. There are even times when I even annoy myself by whining! Unfortunately, I’m not the perfect role model all of the time…or even most of the time, but I do try. Thankfully, Sherrill S. Cannon was also such a child, and her mother had a creative story she used to tell the children. It was called Peter And The Whimper-Whineys. Peter And The Whimper-Whineys was the first book written by Sherrill S. Cannon. In fact, it re-tells the story her mother had told her children, grand-children, and great-grandchildren. Sherrill thought it had such good value that she put the story to paper, using her lovely rhyming style that helps to lighten the mood in this darker book. Peter is a little rabbit, and he’s not a very happy bunny. He has a very negative attitude. He thinks that life isn’t fair; his sister has more soup in her bowl, more jam on her roll, and he doesn’t want to share or play with her. He wants everything his way. Peter’s mother tells him that if he doesn’t calm down and stop whining, he’ll be sent away into the forest with the Whimper-Whineys. When Peter goes to bed that night, he leaves the house and finds a strange man in the forest who has come to take him to Whimper-Whiney Land. The Whimper-Whineys live deep in the forest and they spend their days crying so much that they’ve created ponds. Everything is sour in Whimper-Whiney Land. Their milk has curdled with their salty tears, and everything has gone bad. They don’t have any table-manners and are generally rude. No one is happy in Whimper-Whiney Land. Finally Peter has had enough of the ill-mannered Whimper-Whineys and tries to head home. He doesn’t know which way to go when he stubs his toe and wakes up in his own bed once again. With the sun shining, and his mother calling him for breakfast, Peter realizes that it has all been a dream. 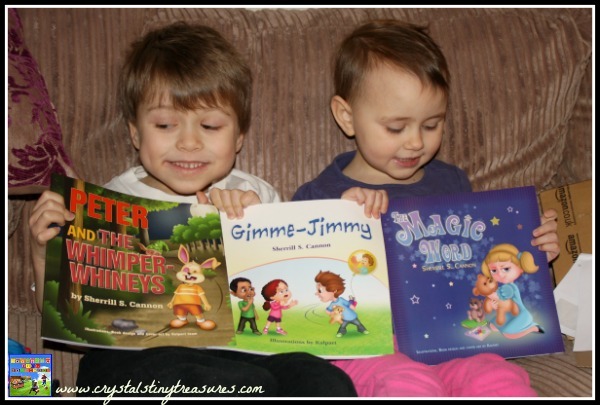 What do my children think about Peter and The Whimper-Whineys? My children were excited to receive this book from Sherrill, and as you can see, it’s this book that has Tristan’s attention! Peter and The Whimper-Whineys puts a smile on the children’s face if I ask them if they are a Whimper-Whiney when the day is long and the tempers are short. It’s enough to distract them and I can redirect their attention to something else. There is a common theme among all of Sherrill’s books, and that is that you’ll find a moral in each of them. This story fits right in with the fairy tales of old. The actions of the characters have consequences (don’t talk to strangers, don’t go into the forest alone). It can be hard when you’re stuck in a cycle of being sour and not liking things. You may not always have control over the actions of others or the things around you. However, you can have control of yourself and your own attitude. Tristan’s favourite part of the story is the final page because Peter is happy. I love that he’s such a positive kid! I snapped this photo of Tristan having a quiet moment looking over Peter And The Whimper-Whineys before we sat down to read it. If you’d like to see a little more about this, and other books Sherrill has written (Gimme-Jimmy, The Magic Word, My Fingerpaint Masterpiece, Santa’s Birthday Gift, or Manner Man), she has some sample pages available to read on Freado. “I love the music of words, and I try to help children hear that music…” If you like what you see, you can find out more about Sherrill on her webpage, follow her on Facebook, or learn more about raising money for the JM Foundation. The latest press release has Sherrill being the recipient of 28 awards in total for her 6 children’s books! What an honour, and well-deserved as her books are entertaining, colourful, and also tell a real-life lesson. My children love her books, and we wonder just what she’ll be coming up with next. Sherrill has plenty of experiences to draw from when she writes. She enjoys travelling across the USA in her camper to visit with her children and grand-children. She’s also a retired elementary school teacher, which no doubt provided a treasure-trove of ideas for her books. Do you have a Wimper-Whiney in your home? How do you deal with it? Let me know by leaving a comment below. This entry was posted in Uncategorized and tagged Award winning, Children's book, Halloween, Sherrill S. Cannon, Whining on October 22, 2014 by Sherrill S. Cannon. 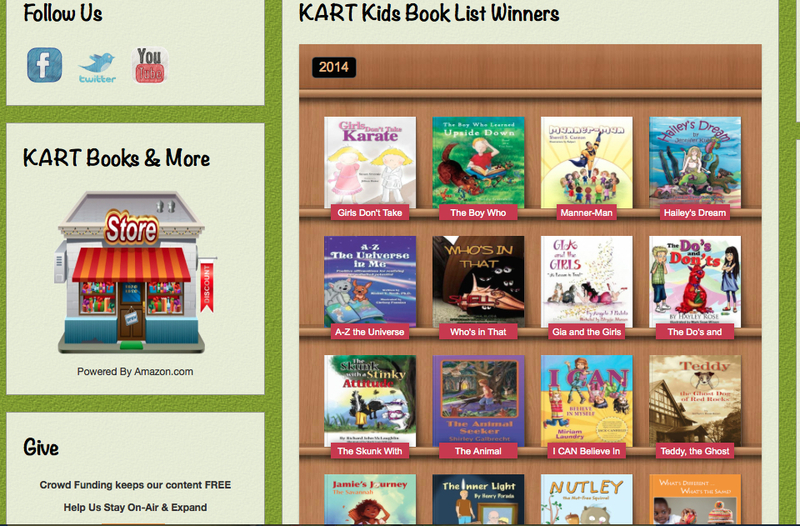 So happy to find Manner-Man on the List of 2014 KART Winners (Kids are Readers Too) He is beyond thrilled!!! This entry was posted in Uncategorized and tagged Award winning, Children's book, KART, Manner-Man, manners, Superhero on October 20, 2014 by Sherrill S. Cannon.